Global Growth is slowing. Worries about a hard landing in China proliferate. What does it mean for the global economy, and specifically, what does it mean for interest rates here in the United States? The secular trends over the last couple of decades have begun to reverse. The late 1990’s and the decade following 2000 were characterized by an unprecedented trend in emerging market growth. Cheap labor and cost advantages enabled BRIC countries to export increasing amounts of goods to developed nations. Concurrently, BRIC nations enjoyed robust GDP Growth up until the Credit Crisis in 2008. 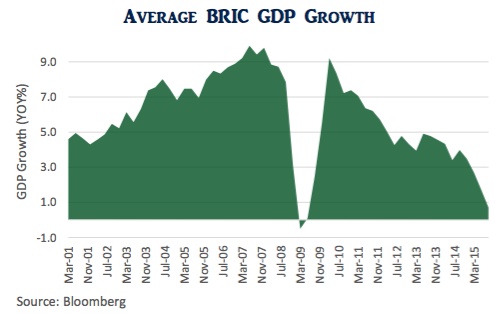 Subsequently, BRIC growth rebounded quickly, but has been on the decline ever since. In fact, it never reached its pre-crisis highs and currently sits at an anemic .7%. The result of the export-driven boom years was ever-increasing trade surpluses that found their way into central bank coffers. From 2003 to 2014, international reserves (excluding gold) ballooned from approximately $3 Trillion to over $12 Trillion. These reserves, naturally, are invested in income producing assets, most notably U.S. treasuries. It has created enormous demand, and it has been a contributing factor to the low interest rates that we have experienced here in the U.S. It is interesting to note, however, that the rate by which these reserves have increased, has been falling since the start of the millennium (red line). It wasn’t until just recently (2014) did they actually start falling. As this trend reverses, marginal demand for U.S. treasuries is also likely to wane. It is a trend likely to continue for years as the productivity gap between developed countries and emerging markets continues to close. The reasons for the BRIC slowdown are many: decreased global demand for manufactured goods, increasing domestic labor costs, the transition from an export-driven economy to a consumption economy in China due to its rising middle class, the supply glut of commodity driven economies (think Russia and Brazil), and the pervasive mismanagement of governments (think Brazil and Russia). The net effect has been a capital outflow from these regions over the past couple of years. This is important, because it has a direct impact on Central Bank tendencies. For the past couple decades, BRIC central banks have been able to conserve FX reserves since weak domestic currencies are a boon to export- driven economies. However, as capital outflows persist, Central Banks are put it a precarious position. Do they support their currency and raise rates, depleting their FX reserves so as to maintain foreign direct investment and contain inflation, or do they continue to let their currencies depreciate to reinvigorate the economy? Russia, in 2014, was forced to deplete considerable reserves to prop-up the value of the Ruble. China did the same in 2015. As the psyche of the international community becomes increasingly wary of declining BRIC growth, Central Banks will be forced to continue on this path, further jeopardizing domestic growth at the margin. As FX reserves are depleted, so too is the marginal demand for dollar-denominated assets, particularly U.S. treasuries. In fact, these are particularly vulnerable since they are the most liquid. The chart below illustrates this point. 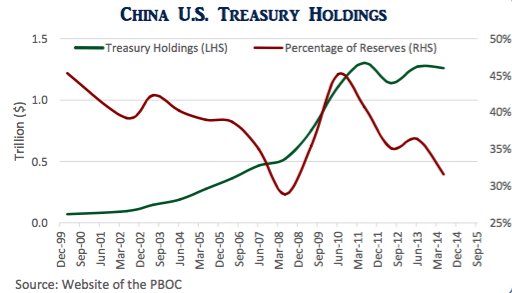 Chinese treasury holdings (green line) have remained relatively stable over the last five years. However, when measured as a percentage of reserves (red line) they have actually declined from approximately 45% to 30%. 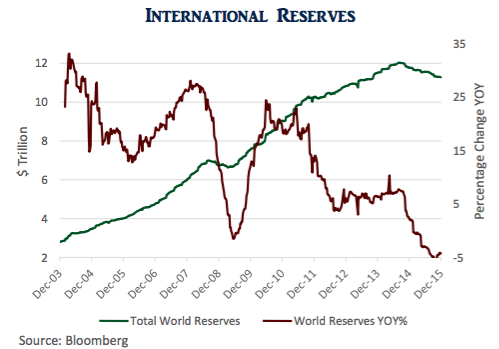 China’s reserves topped out in the middle of 2014, and have been declining since, for the first time ever. This is notable since it represents an important inflection point and suggests declining demand for U.S. treasuries in the future. The Great Recession has affected investor psyche and continues to have an effect on capital flows, particularly foreign direct investment in BRIC countries. Growth in these countries never fully rebounded and have been declining at an alarming pace. The expectation prior to the crisis was that these developing economies would continue to grow at high rates. When they didn’t, it became painfully obvious that there was a supply glut of raw materials. Commodity markets have corrected in response. But what economists are not talking about, is the glut of savings that was created over the past couple of decades in the form of central bank reserves. As BRIC nations are now forced to protect their currencies, this glut will not persist and will also self-correct, much to the dismay of treasury investors.